The first French-Canadian unit was formed on April 9, 1869, after Confederation; it was composed of two temporary regiments — one from Témiscouata and the other from Rimouski. On November 1, 1920, after a series of militia reorganizations, this military group was officially named Les Fusiliers du St-Laurent. A number of the regiment's members participated in the two world wars of the 20th century and three of the region's valiant fighters were awarded Victoria Crosses. From 1942 to 1945, the regiment was also responsible for defending the coast. German submariners were wreaking havoc in the gulf and fears of sabotage operations led to the mobilisation of hundreds of men — known as the "Soldiers of the Coast" — to protect some 3,000 km of coastline. Events that occurred during this period notably included the capture of an Italian crew at Bic following the scuttling of their ship the Capo Noli, the torpedoing of the ferry SS Caribou on its way to Newfoundland which claimed 137 lives, and the explosion of the HMCS Raccoon off Cap-Chat. A symbolic time for Les Fusiliers du St-Laurent regiment, the "Soldiers of the Coast" period covers the years from 1942 to 1945 when people had to protect the shores of the St. Lawrence. Faced with growing public concern, the second and third battalions of Les Fusiliers du St-Laurent were assigned to domestic defence. They made sure people complied with the "blackout" directive (no lights were allowed to be visible from the water side), and they protected communication channels and important infrastructure. 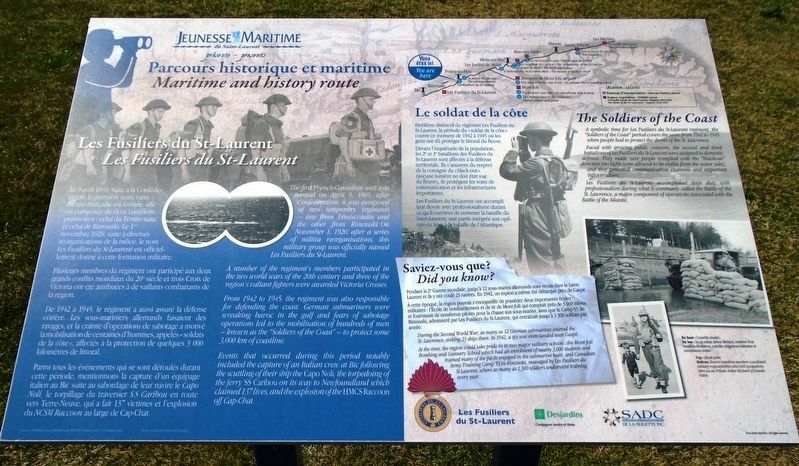 Les Fusiliers du St-Laurent accomplished their duty with professionalism during what is commonly called the Battle of the St. Lawrence, a major component of operations associated with the Battle of the Atlantic. [Photo] Bottom: Reserve battalion members conciliated military responsibilities and civil occupations. Here we see Private Arthur Richard of Grande-Vallée. During the Second World War, as many as 12 German submarines entered the St. Lawrence, sinking 23 ships there. In 1942, a spy was even landed near Gaspé. Le 9 avril 1869, suite à la Confédération, la première unité canadienne-française est formée; elle est composée de deux bataillons provisoires : celui du Témiscouata et celui de Rimouski. Le 1er novembre 1920, suite à diverses réorganisations de la milice, le nom Les Fusiliers du St-Laurent est officiellement donné à cette formation militaire. Plusieurs membres du régiment ont participé aux deux grands conflits mondiaux de 20e siècle et trois Croix de Victoria ont été attribuées à de vaillants combattants de la région. De 1942 à 1945, le régiment a aussi assuré la défense côtière. Les sous-mariniers allemands faisaient des ravages, et la crainte d'opérations de sabotage a motivé la mobilisation de centaines d'hommes, appelés « soldats de la côte », affectés à la protection de quelques 3 000 kilomètres de littoral. du NCSM Raccoon au large de Cap-Chat. Emblème distinctif du régiment Les Fusiliers du St-Laurent, la période du « soldat de la côte » couvre ce moment de 1942 à 1945 où les gens ont dû protéger le littoral du fleuve. Devant l'inquiétude de la population, les 2e et 3e bataillons des Fusiliers du St-Laurent sont affectés à la défense territoriale. Ils s'assurent du respect de la consigne du « black-out » (aucune lumière ne doit être vue du fleuve), ils protégent les voies de communication et les infrastructures importantes. Les Fusiliers du St-Laurent ont accompli leur devoir avec professionalisme durant ce qu'il convient de nommer la bataille du Saint-Laurent, une partie intégrée aux opérations liéns à la bataille de l'Atlantique. [Photo] En haut : Contrôle routier. [Photo] En bas : Ici, le soldat Arthur Richard, membre d'un bataillon de réserve, concilie obligations militaires et occupations civiles. Pendant la 2e Guerre mondiale, jusqu'à 12 sous-marins allemands sont venus dans le Saint-Laurent et ils y ont coulé 23 navires. En 1942, un espoin a même été débarqué près de Gaspé. de 3 000 élèves et fournissait de nombreux pilotes pour la chasse aux sous-marins, ainsi que le Camp 55 de Rimouski, administré par Les Fusiliers du St-Laurent, qui entraînait jusqu'à 1 300 soldats par année. At the time, the region could take pride in its two major military schools : the Mont-Joli Bombing and Gunnery School which had an enrol[l]ment of nearly 3,000 students and trained many of the pilots engaged in the submarine hunt, and Canadian Army Training Camp 55 in Rimouski, managed by Les Fusiliers du St-Laurent, where as many as 1,300 soldiers underwent training every year. Erected by Les Fusiliers du St-Laurent, Desjardins, and SADC. Location. 48° 31.032′ N, 68° 28.151′ W. Marker is in Rimouski, Quebec, in Rimouski-Neigette MRC. Marker is on rue du Phare, on the right when traveling east. Touch for map. Marker is adjacent to the Empress of Ireland Museum, at Pointe-au-Père Maritime Historical Site. 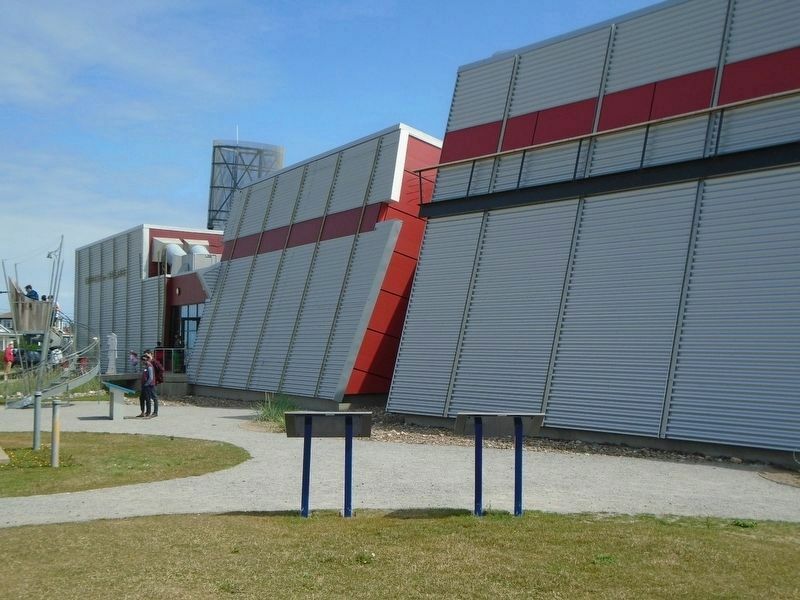 Marker is at or near this postal address: 1000 rue du Phare, Rimouski, Quebec G5M 1L8, Canada. Touch for directions. Other nearby markers. At least 8 other markers are within walking distance of this marker. La station de pilotage / The pilotage station (here, next to this marker); Père Nouvel (a few steps from this marker); Les gardiens de phare / The lightkeepers (a few steps from this marker); Les pilotes / The pilots (a few steps from this marker); Polyvalence / Versatility (within shouting distance of this marker); Les pilotes du Saint-Laurent / St. Lawrence Pilots (within shouting distance of this marker); Fumée de mer / Smoke from the Sea (within shouting distance of this marker); Le phare de Pointe-au-Père / Point-au-Père Lighthouse (within shouting distance of this marker). 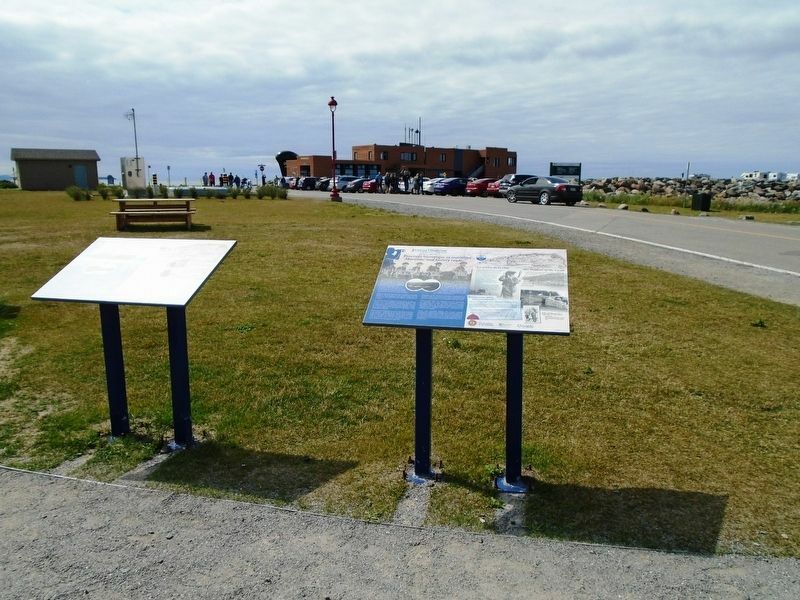 Touch for a list and map of all markers in Rimouski. More. Search the internet for Les Fusiliers du St-Laurent. Credits. This page was last revised on December 11, 2018. This page originally submitted on December 10, 2018, by William Fischer, Jr. of Scranton, Pennsylvania. This page has been viewed 51 times since then and 6 times this year. Photos: 1, 2, 3. submitted on December 10, 2018, by William Fischer, Jr. of Scranton, Pennsylvania.